THE NATURAL HAVEN: Readers' Questions: Sulphur and a reason to use Crisco? Readers' Questions: Sulphur and a reason to use Crisco? I did a literature search today to check if there are any updates to the use of sulphur. There is very little that you can put on your scalp to affect hair cells which have not yet been produced. This is the reason why topical application (direct application to the scalp) of most things purported to enhance hair growth is usually of little benefit. My previous posting on taking sulphur in the form MSM supplements is here. 1. Porosity is not that simple to assess. There are many subjective tests that are proposed on many forums but for me, the only true test would be with a very powerful microscope (known as a scanning electron microscope). 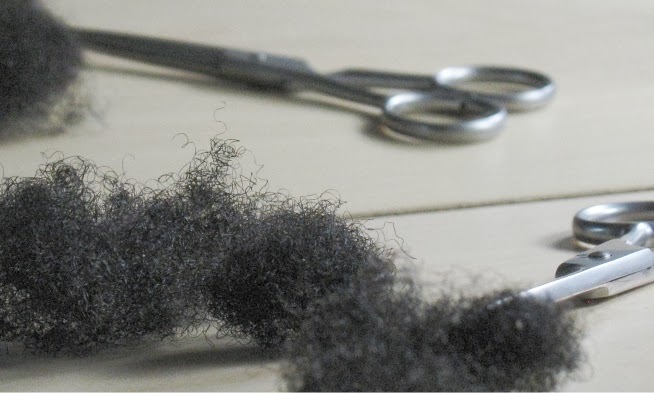 If you do not dye or have chemicals in your hair and you do not comb your hair aggressively, I doubt that you would have porosity issues (click here for my porosity series). 2. Natural African hair does tend to be dry (this is normal). This can easily be remedied easily with water. The side factor that most of us do not like is the shrinkage. 3. To moisturise your hair, oils are not the first choice. Water and water based products (for example conditioner) are first choice. I would encourage you to start reading some ingredient lists and find out what works for your hair. To get you started - click here for my guide to deciphering those ingredient labels. 4. The no poo method is not always the way to go. If you regularly use oils or hair creams, it is probably useful if you shampoo your hair regularly too. 5. If you are going to pick an oil to use in your hair, choose a 'not so healthy' one for eating. (I'm beginning to think that the cooking butter/crisco users may not be wrong lol). Anyway, the story goes that to get an oil to penetrate into the hair, it should contain fats which are saturated or monounsaturated. This is because saturated oils are more compact in size and more able to manoeuvre. However, polyunsaturated oils tend to be larger in size and not very mobile therefore less likely to penetrate. (Journal of Cosmetic Science, pg 169-184, 2001). Search this blog for 'oil', read a few of the comments and find out which oil you would like to use. 6. There are so many people who swear by glycerine for moisture (click here to read the post). I have a post coming up in a week or so on the water and oil theory in curly hair, so stay tuned! Thank you so much for the article!! I have been seeing a lot of people rave about Bee Mine Serum with Sulfur and Mega Tek and that definitely put up a red flag in my mind?? Why sulfur...I will continue to use wave nouveau and coconut oil/ water on my hair just to be on the safe side Thanks again! !